On the edge of an indigenous forest, this delightful Garden Route country hotel overlooks a magnificent nature reserve, close to Plettenberg Bay's stunning beaches and attractions. 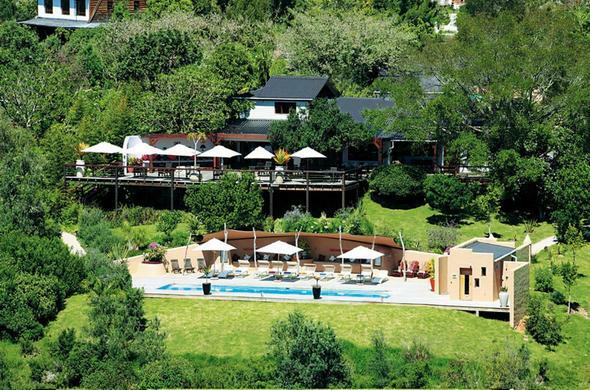 Hog Hollow, a Garden Route country hotel, offers a superb retreat in spectacular scenery. Excellent service and comfort await guests in this outstanding South African destination on the coast. This eco-friendly hotel in South Africa has 16 spacious en-suite rooms. Each suite has a deck with uninterrupted views of the indigenous forest and Tsitsikamma Mountains. A lounge area and hammocks entice guests to relax. Plettenberg Bay on the Garden Route is a holiday playground. Its beautiful beaches and nature walks are ever popular. Year round visitors escape here for outdoor adventures in the summer and cosy relaxation in the winter. Shops support a thriving arts and crafts community and restaurants satisfy all tastes. The main house at Hog Hollow Country Lodge has many features. There are 3 lovely lounges, one leads to the comfortable boma (outdoor enclosure) and the other to the garden. There is a clear blue swimming pool and attractive terraced deck, bar and a viewing deck overlooking a river gorge. Some of the best views are to be found from the forest sauna and shower. Delicious meals are served in different settings around the lodge. Hog Hollow is famous for its large dining table, candlelit dinners and personalised service. Each morning, the hosts assist guests with individual excursion planning and advice.